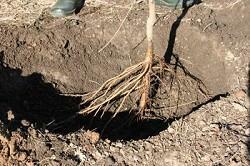 Dig or rototill the soil to a depth and width that will accommodate tree roots. Roots can grow 2 to 3 times the width of the tree canopy. If the soil is compacted, find ways to loosen it or consider using raised mounds or planters. Uniformly incorporate compost or manure into the soil - not just in the planting hole. Examine the roots of bare-root trees and cut off any roots that are broken or kinked. Avoid shortening roots - make the hole bigger to accommodate them. For container-grown trees pull away circling or girdling roots. 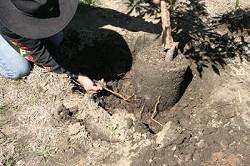 Place the tree in the hole with the graft union several inches above the soil surface. 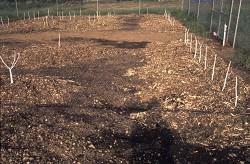 Always plant high - the tree should be on a slight mound and the roots should be just below the surface. Be sure to allow for settling, because if a basin forms and water stands around the trunk, the tree will die or be stunted due to crown or root rot. Apply a layer of mulch or wood chips a few inches thick in a radius 2 to 3 feet (60 to 90 cm) around the tree. Paint the entire trunk with interior white latex paint diluted 50/50 with water. Irrigate thoroughly using a doughnut ring and/or install drip irrigation. Citrus trees planted in a raised bed filled with loose topsoil at the Fair Oaks Horticulture Center; heavy clay soil lies beneath. The healthy root system of this bare-root tree has no broken roots so it does not need to be pruned. The hole is widened to accommodate all of the roots. Roots of containerized trees should be pulled out when planted. Fruit trees just planted at the Horticulture Center in 1998, painted white for sunburn protection, and mulched to conserve moisture. After planting, create a doughnut ring around the tree to water the roots in, or install a drip line and water thoroughly.